Folks who are regular readers may have noticed that there’s a method to the posting madness here at Home Keet Home. I typically put up a new blog post every Tuesday and Friday. I find that, for the first time in over a year and a half, I’m going to miss a couple! I think I’ve mentioned in a few posts that my full time job can occasionally be a full time (plus), and that I do some travel for work. Usually I write posts in advance so there’s no interruptions, but this trip I’m going to try something different. It’s a joy of mine to interact with people the day that a new post goes up – I find that between comments on the blog and conversation on Facebook and Twitter I’ve usually learned a few things by the end of the day from readers, which I really appreciate! Since I’ll be in the air today and totally immersed in work on Tuesday, I would miss the chanced to engage about the topic of the day, and I don’t want to a. seem totally disinterested and b. lose out on the opportunity to “talk”. I’ll be back by next Friday’s post, totally exhausted from my trip and trying to snuggle all my flying imps against their will! Have a safe trip. Here on the east coast we are having a nor’easter/fierce winds and airports are delayed.Hope the power stays on. 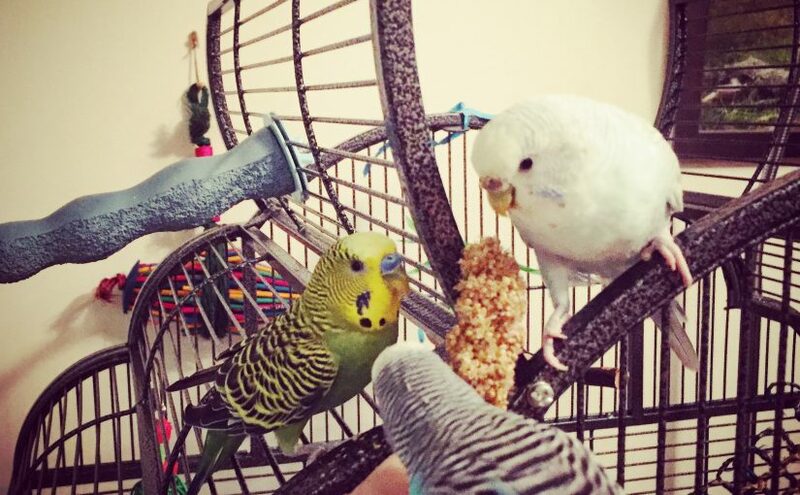 I teach and classes are canceled so my budgies are excited about me being home. Really enjoy your posts. Thank you! I’m in the Albany, NY area and currently keeping my fingers crossed that I’m actually leaving today! I hope you have a great day home with your budgies and don’t lose electricity! 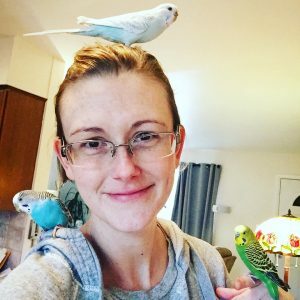 I have a question about the picture at the bottom of this post…how did you get your parakeets to be so comfortable around you? My parakeets seem to hate me. They will get scared if I try to touch them. Well, to be fair – Kevin (the green bird) is not that comfortable around humans, but he will “step up” pretty well and sit for a few moments before getting the heck out of dodge. 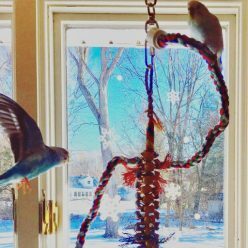 Toby, the blue budgie, we spent tons of time taming. She came from Petsmart and was terrified of us at first. It took many months and lots of millet to get her liking people. Now I’m fairly sure she thinks is a person…. I find that what has worked for me is stillness, hiding my hands initially, not making eye contact, and acting like I’m not terribly interested in the parakeet. At least in my experience they tend to be fairly curious once they stop being afraid. I also don’t really try to touch them, but let them come to me on their terms. So, we don’t do neck or head rubs or kisses or anything of the sort. I’m sure there are tons of other ways to go about it, but the long game is what’s worked for me. Also, if you want a bird on your shoulder or head, putting a spray of millet on there and waiting until they work up their courage has worked for me! I see, well maybe I will try acting less eager. Thank you for the advice! I have been trying slowly to get them to be less fearful but it just don’t seem to want to adjust. Even if I go near their cage, they scoot to the other side. If I change out their water of food dishes, they frequently will get crazy. I have had them for about 5 years, but wonder if this is from their previous home. I also wanted to ask you about one of them. My blue girl has some feathers above her cere that look like she has put too much blush on. I haven’t been able to find anything on the internet about it and there are no Avian Vets near me. Have you ever seen or heard anything like that? Is there anything in your girl’s cage that could be staining her feathers? Kelly’s head is almost all pink at the moment because she keeps rubbing her head against a toy. It can be tough to break them out of that fear, I’m sorry yours are being so resistant. You’ve probably already tried this, but I recommend putting a hand outside or inside the cage without moving it, for as long as you can hold the hand there, as many times a day as you can.